Working in a museum I come face to face with life’s extraordinary diversity every day. Specimens a few hundred years old tell us of the richness of life right beneath our feet. Older specimens provide a glimpse into amazing animals and plants of the past. I am extremely lucky to be able to discover and learn new things daily, and to be able to share this with the public. Individual species; individual specimens; individual collectors: they all have their own little stories. Stories that stop all museum collections from just being ‘in a dusty old store room’. Stories that make sure that millions of specimens do not remain silent in death. There are dozens of different stories within museum collections. 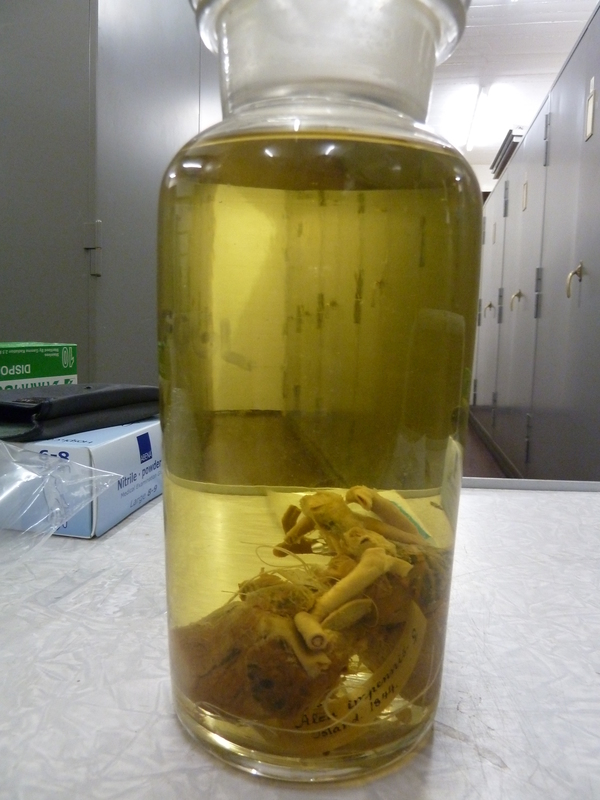 Of course there’s the ‘famous’ specimens from those well-known collectors, but there is much, much more. There’s examples of life’s biodiversity on your doorstep. There’s the curious characters of collectors and the strange motivations of collecting. There’s the evolutionary links between animals, and unique features. There’s millions of years of geological history in a few drawers of minerals. The story of life: museum collections are a record of life, life around us today, and life that has vanished. I could go on. Perhaps the most poignant story in all museums across the world is extinction. Ancient fossils tell us of life that once was. Memento Mori! 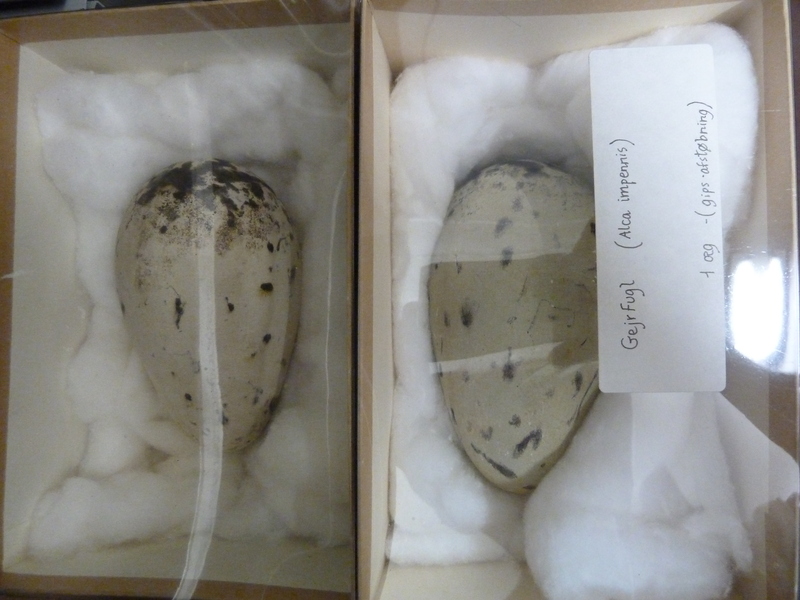 Even with modern specimens there are species that are now extremely rare or extinct. These modern extinctions are often the most striking and shocking: because humans definitely caused them. Some extinctions maybe indirectly as a result of humans. Woolly mammoth populations were already shrinking because of the warming climate, and human hunting was an additional pressure that these giants couldn’t save themselves from. The dodo is a classic example of extinction, although humans didn’t hunt them to extinction, it was the other animals that we brought to the island that caused their doom. There are a number of more powerful examples of extinction. Steller’s sea cow, became extinct just 27 years after it was formally named as a species. It was hunted for its meat and no doubt the sailors had no idea the devastating impact they had. The thylacine is another infamous example of how easily a species can be exterminated forever: purposefully hunted because of their threat to livestock in Australia, these enigmatic marsupials were purposefully wiped out just 82 years ago. There is one example of extinction caused by humans is the most brutal of all. Brutal. Shocking. Gut-wrenching. Thoughtless. Stupid. It is hard not to get emotional when reading accounts of the mass genocide of the Great Auk. Pinguinus impennis, the great auk, was an impressive, large, flightless diving bird. Similar in appearance to its close relative, the cute razorbill (Alca torda), only it was much larger, reaching almost a meter tall. An enormous, sharp, curved, black beak protruded proudly from it’s black feathered face. A beak perfect for catching slippery fish in the cold North Atlantic waters. And it was very agile in the water: small stubby, flipper like wings, propelled it through water with ease. A thick layer of fat kept it warm in the cold north (the scientific name Pinguinus means ‘plump’ referring to the somewhat chubby appearance of this bird). This was an impressive bird. Too impressive to have had such a bloody and brutal end. A gorgeous wood engraving of a Great Auk by Thomas Bewick. (From ‘A History of British Birds’, 1804) Image from here. Living off the rich fishing grounds in the North Atlantic, the great auk was found along the coasts of Britain, Ireland, France, Greenland, Iceland, Norway, north east America and the Faroe Islands. This was once an incredibly widespread bird. Whilst spending most of the year in the open waters, they needed land for breeding. Great auks were quite specific about where they bred. Preferring islands that were very rocky, they also needed to have slopes for easy access to and from the sea: these birds were no ballerinas on land. The islands had to be at a good enough distance from the mainland so that polar bears couldn’t get there. Just seven breeding islands are known, although there were undoubtably more in the past. Hundreds of thousands of birds came to these islands once a year to meet their mate: the great auk had a single mate for life. Year after year they would return to the same spot, with the same partner, and spend their time on the island rearing just one egg. In a cruel twist, these islands that created life would become islands of death. 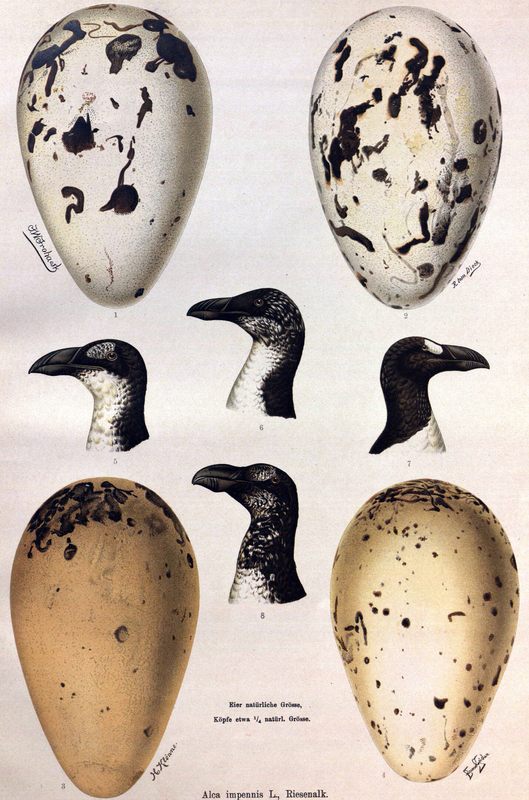 As with so many animals, the great auk had their natural predators. Killer whales (Orcinus orca) would hunt them when they were at sea. And whilst on land nesting, white tailed eagles (Haliaeetus albicilla), arctic wolves (Canis lupus), arctic foxes (Vulpes lagopus) and polar bears (Ursus maritimus) would hunt them. For around 100,000 years great auks had lived and survived with these predators. 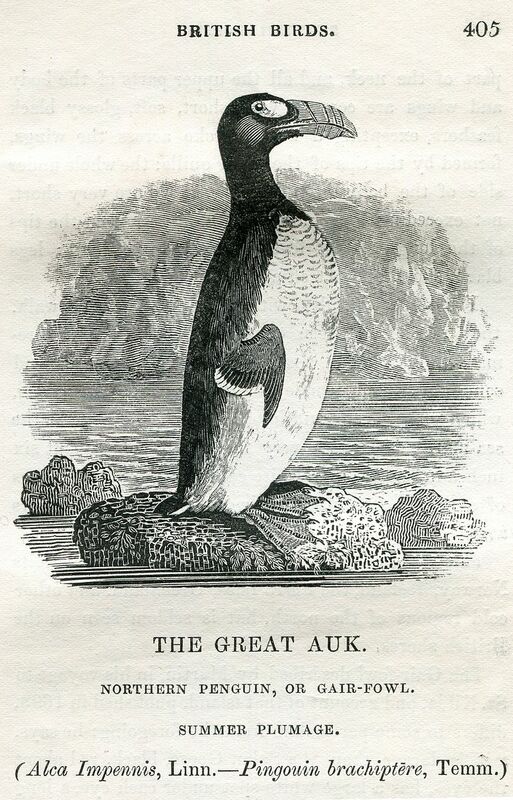 Humans have hunted great auk as a source of food for tens of thousands of years. Bones from the incredible Neanderthal site at Gibraltar show that they were eaten around 100,000 years ago. For modern humans they have been captured in cave art around 35,000 years ago in Spain and again in France around 25,000 years ago. Sites across Europe and in North America have held bones of great auk, fascinatingly with many of these sites associated with human burials. One site in Newfoundland, dating to around 4000 years old, had over 200 beaks, suggesting the body was wrapped in a cloak decorated with the large beaks of this bird. 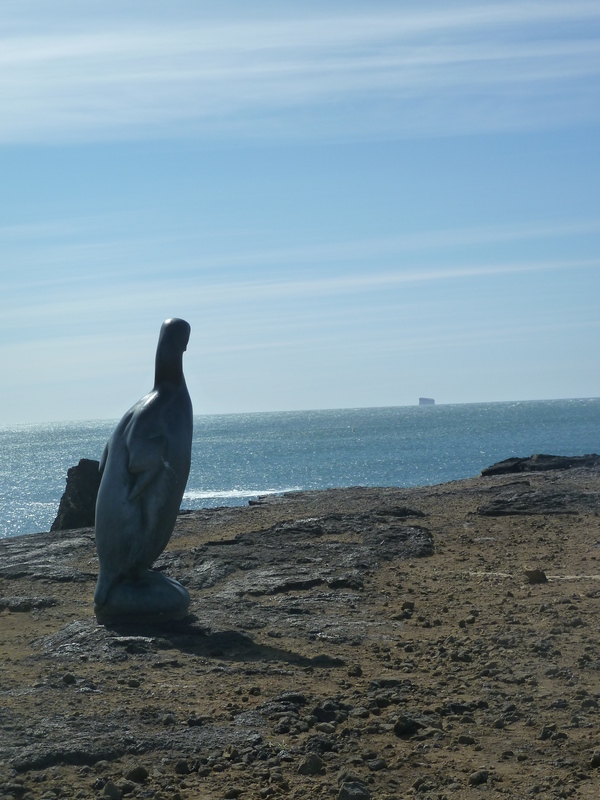 There was certainly something that gave the great auk an air of respect to humans all those thousands of years ago. It appears this admiration and reverence disappeared as Europeans began to set sail and explore the oceans in the 16th century. And it was this greed that catastrophically tipped the balance. The breeding islands were well known by sailors as an important stop off to replenish their food supplies. The French explorer, Jaques Cartier, travelled across the Atlantic in 1534 to search for new rich lands. He was the first European to discover Canada, which he claimed for France. Before landing, his ship stopped at Iles-aux-Oiseaux to replenish stocks. Here they slaughtered over 1000 birds: the majority of which were great auks. Many sailors over the years exploited the breeding colonies for meat and eggs: one captain notes that 100,000 eggs were taken in a single day. 100,000!! For a bird that only produces one egg in a batch, this amount of eggs taken would have been utterly disastrous. They were not only used for their meat. Their thick greasy oil which kept their feathers from getting wet, was used for fuel. Killed in their thousands, fisherman collected thousands of litres of oil. And this oil was good for burning fires too. 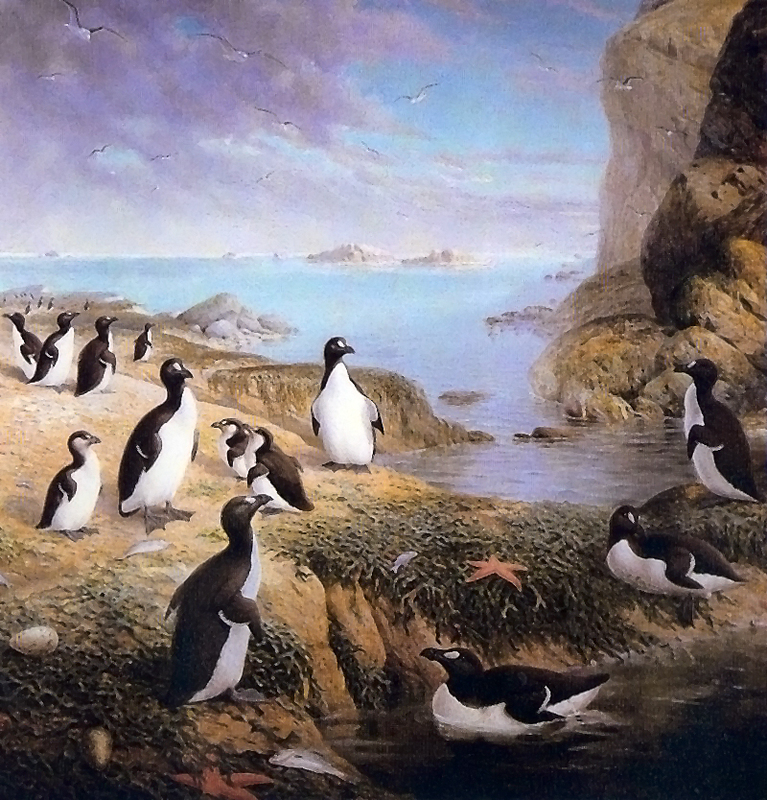 The great auk breeding islands had no trees or vegetation that could be used to make fires. So the sailors made fires with bodies of the birds. Horrifically, these fires were used cook other great auks. Within just a few hundred years since they were first overexploited by Europeans in the 1500s, populations of this beautiful bird had plummeted. So much so that in 1794, Great Britain banned the killing of this bird (except for fishermen using their meat as bait). Bu it was already too late. Where there were once hundreds of thousands, there were now just dozens. Because they had become so rare, collectors were offering large sums of money for specimens. They vanished in Britain in 1840. Island by island they were disappearing. Their last stand was on Eldey Island, off Iceland. In 1844, fishermen killed the last two known great auks on Eldey Island to supply a museum collector. The birds tried to run from the attack, but not being very quick on land, their waddle only got them so far. Their necks were wrung. The pair had been sitting on the island with no others of their kind around. They were the last. Alone. But they were creating another. On the empty island, they sat on an egg. The last egg of an entire species. It was crushed under the boot of one of the fishermen. The Great Auk met a bloody end. Today there are so many animals on the brink of extinction. Pangolins, the adorable scaly mammals, are exploited for trade. Rhinoceros and elephants too often meet horrific deaths by poachers. Tigers are hunted for their fur and bones for traditional medicines. These, and so many more animals, are terrifyingly close to vanishing forever. The story of extinction is not just in the past. Surprisingly there are only a few specimens in museums today. Around 80 taxidermy specimens and a few dozen eggs worldwide can be seen on display: telling their story in death. And those last two poor individuals brutally killed? Their insides are preserved at the Natural History Museum of Denmark, and until very recently, their skins were lost. Genetic analysis of the preserved insides and testing of different skins matched one specimen at the Royal Belgian Institute of Natural Sciences, Brussels. Sadly the female skin is not yet found. For these birds that spend their lives finding each other every year to mate, it would be some kind of wonderful to be able to find the female and reunite them once again. Postscript: Have a look at #TheLostAuk tweets for lots of amazing images from museum collections around the world. Bourne, W. R. P. (1993). ‘The story of the Great Auk Pinguinis impennis.’ Archives of Natural History.20(2). pp.257-278. Meldegaard, M. (1988). 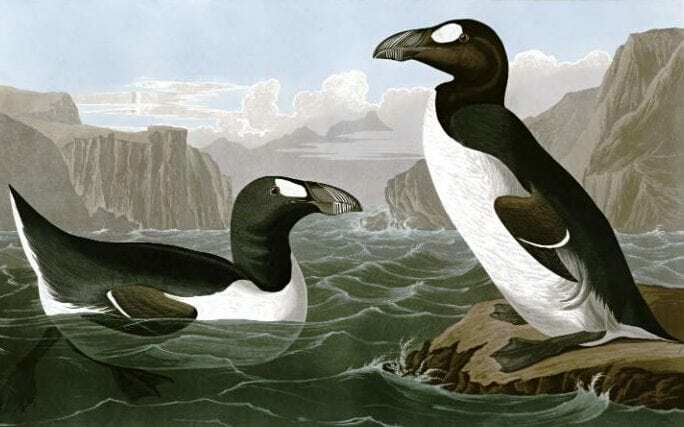 ‘The Great Auk, Pinguinus impennis (L.) in Greenland.’ Historical Biology. 1(2). pp.145-178. This entry was posted in great auk and tagged Dodo, great auk, Pangolin, Pinguinus impennis, Rhinoceros, Tiger, Woolly Mammoth. Bookmark the permalink.